Hidehiko Yamabe's father was Takhiko Yamabe. It was a large family with Hidehiko being his parents' fifth son. The family were well off but Hidehiko's health was poor and his parents were warned by the doctor who treated him that he was unlikely to live much beyond twenty years of age. Hidehiko attended elementary school in Ashiya than continued his secondary education close to his home. In 1942 he was sent to The Third High School in Kyoto, following the practice in Japan at this time to send exceptionally talented boys to one of a small number of senior high schools before entering university. Despite his health problems he loved sports at secondary school but his health prevented him from playing as much rugby as he would have liked. Quite often classes could not be held regularly during World War II. Quite often he had to go to work in fields and factories with his classmates. A connected locally compact group G is a projective limit of a sequence of Lie groups; and, if G has no small subgroups, then it is a Lie group. This problem had been investigated by many mathematicians such as Chevalley, Gleason, Iwasawa, Kuranishi, Montgomery, Pontryagin, von Neumann, and Zippin. Yamabe began to produce partial results in papers such as On some properties of locally compact groups with no small subgroup (1951) written with Morikuni Goto, which shows that in a locally Euclidean group with no small subgroup every point sufficiently near the identity is on a unique one-parameter subgroup. Also in 1951 he published Note on locally compact groups which again attacks Hilbert's Fifth problem and gives results proved independently by Chevalley and Gleason. Further progress came in On a problem of Chevalley (1952). 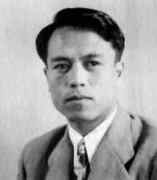 Despite the large amount of progress that Yamabe was making to solve Hilbert's Fifth Problem, he was also producing many other papers such as: (with Zuiman Yujobo) On the continuous function defined on a sphere (1950); (with Morikuni Goto) On continuous isomorphisms of topological groups (1950); On an extension of the Helly's theorem (1950); and A condition for an abelian group to be a free abelian group with a finite basis (1951). In 1952 Yamabe married Etsuko and a few months later they travelled to the United States where Yamabe took up a post at Princeton as Deane Montgomery's assistant. It was during his two years at Princeton that he published the two papers On the conjecture of Iwasawa and Gleason and A generalization of a theorem of Gleason. Both papers appeared in 1953 in the Annals of Mathematics and together they give a final answer to Hilbert's Fifth Problem. This is undoubtedly Yamabe greatest achievement, although he went on to produce many more very high quality pieces of work. This paper presents a new, elegant method for constructing Green's function G for the heat equation over any domain D in Euclidean space. He enjoyed American life and was fully Americanised, yet there were nostalgic moments. It was quite difficult for him to forget his strong attachment to his mother country. In addition, as the number of young mathematicians from his country who settled in the United States increased, he started to wonder if he should go back to Japan to help the younger generation. He had some dreams about this and went back to Japan in September 1958 to take up the position of Professor at Osaka University to see if his plans were workable. It was proved by P J Heawood that the four-colouring of a given "normal" map (having 2n vertices, 3n edges, and n + 2 faces or countries) is equivalent to the solution of a system of n + 2 congruences modulo 3 for 2n unknowns (each equal to ±1, and each occurring in three of the congruences). The authors have coded this problem on the UNIVAC Scientific 1103 computer, which took 25 minutes to obtain the 146 solutions in a typical case with n = 18. The Yamabe Memorial Lecture has been held since 1989, through support from a fund created by Etsuko Yamabe and through contributions from a number of mathematicians. The lecture has been held in alternating years at the University of Minnesota and at Northwestern University. ... The Yamabe Memorial Symposium is an enhancement of this tradition. Mathematicians will gather every two years at the University of Minnesota for a long weekend to hear geometry talks, discuss the latest research and interact with younger mathematicians. One goal will be to advance areas of mathematics related to the interests of Hidehiko Yamabe, which touched in a substantial and ground-breaking way on several quite different areas of mathematics, all of which may be roughly described as having significant geometric aspects.